Your Life is a Cliffhanger. What Will Happen Next? When I walk a cemetery, I look for stories in the gravestones. Sometimes the markers are very large and ornate, and other times quite small and humble. I wonder how accurate they are in reflecting the greatness of the lives they represent. Sometimes there are bible verses, or a few descriptors, like “devoted husband, father, and friend.” Sometimes there are mentions of military service, and I imagine the horrors witnessed and the heroics performed. Sometimes the date span is much too short, a sad memorial to the life of a baby taken from our world too soon. But something about gravestones like this one are extra poignant. “Till death do us part.” This is promise Lois and Albert made to one another a long time ago, on their wedding day. Albert’s story is finished, in this world, at least. Something about the dates being carved in stone make it so real, and permanent. But Lois, her life feels like it’s on pause. A cliffhanger. Like someone with a chisel is waiting in the wings, at the ready to stamp that second date under her name, completing the story of this gravestone. Fifteen years passed since Albert’s death and me taking this photograph. I don’t know either of them, but I can’t help but wonder what Lois is up to now. Is she happy? Still grieving? Or maybe both? Does she live alone, or with family, or perhaps in a nursing home? Has she made the most of this time she’s been given, before reuniting with the love of her life? 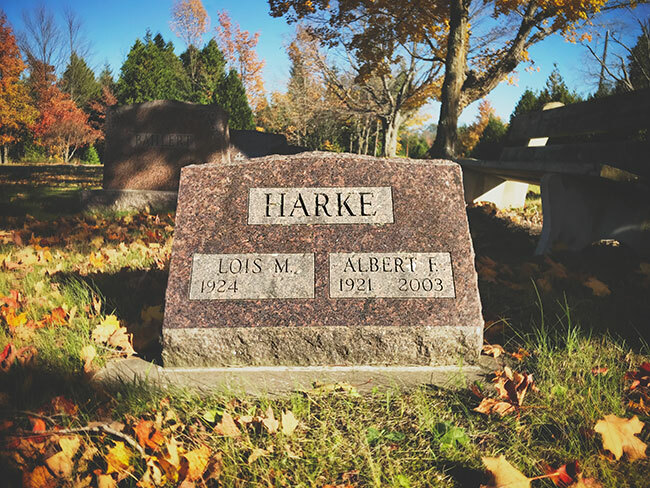 I wonder what it would be like if, once we reached a certain age, acquiring our gravestones was mandatory, with the birthdate stamped in granite. Like when we get our driver’s license, or before we can vote. Maybe it would be easier to put things in an eternal perspective, and cast aside our trivial worries and concerns. Maybe it would be easier to remember that buying that shiny new thing isn’t going to make us all that happier in the long run. Maybe it would be more obvious to us that most of the things that clutter our to-do lists are pretty inconsequential, and that the neglected or damaged parts of our relationships are really where we should be spending our time. Maybe it would be easier to give a little grace to our parents, spouse, or sibling, overlooking their annoying habits and forgiving the transgression that grieves us so. Maybe it would crystallize what we’re put on this earth to do, rather than pretend we’re uncertain simply because we’re too afraid to decide or take the first step. Maybe knowing that the final date could be stamped in at any moment would force us to really slow down, bringing into focus the beauty and blessings that too often fly by, unnoticed in our hurried existence. For a whole host of reasons, it’s probably impractical to make people acquire their gravestones early. But you have the ability to imagine your own, right now: It’s hard, and cold, and extremely heavy. Your name is chiseled on the top in big, capital letters. Below that, you can run your fingers across the four numbers that indicate the year you were born, feeling the sharp edges and deep indents in the stone where it is carved. But to the right of that date, is nothing but smooth, polished granite. You’re in the midst of life’s great cliffhanger. What will you do next?